Date of Birth: 7th Rajab 26 AH. Date of Martyrdom: Martyred in Karbala (Iraq) at the age of 36, on Friday, 10th Muharram 61 AH and buried there. Hazrat Ali (a.s.) married Fatimah Bint-e-Huzaam Ibne Khalid (a.s.) in 24 Hijrah. 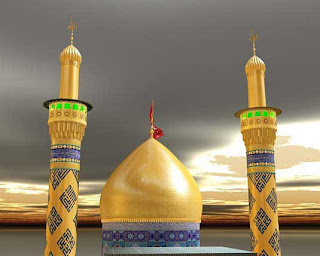 Fatimah gave birth to Hazrat Abbas (a.s.) on the 7th Rajab, 26th Hijrah. In 27th Hijrah Ja'far was born and in 29th Hijrah Uthmaan was born. Abdullah was born in 32nd Hijrah. Because she had four sons Fatima Binti Huzaam was known as Ummul Baneen (Mother of Sons). Ummul Baneen, from the very first day she entered Hazrat Ali's (a.s.) house, treated the children of Bibi Fatimah (s.a.) with utmost respect. She brought up her own sons to look upon Imam Hassan (a.s.), Imam Hussain (a.s.), Bibi Zainab (s.a) and Bibi Kulthoom (a.s.), not as brothers and sisters but as masters and mistresses. Imam Hussain (a.s.) was very attached to Hazrat Abbas (a.s.). When Hazrat Abbas (a.s.) was born, Hazrat Ali (a.s.) asked Imam Hussain (a.s.) to recite the adhaan and the iqamah in the ears of the child. When he was on the arms of Imam Hussain (a.s.), the infant smiled and raised his arms. There were tears in Imam Hussain's (a.s.) eyes. Was it because he knew that the child was trying to say: "O Mawla I have come and will happily give these my arms and my life for you and Islam". In early childhood Hazrat Abbas (a.s.) would follow Imam Hussain (a.s.) like a shadow. If Imam Hussain (a.s.) looked thirsty, Abbas (a.s.) would rush to bring him water. If Imam Hussain (a.s.) seemed hot, Abbas (a.s.) would fan him with the hem of his cloak. At the battle of Siffeen in the 34th Hijrah, Abbas (a.s.) was only eight years old. Imam Hussain (a.s.) was fighting in the battle field. When Hazrat Abbas (a.s.) saw an enemy soldier approaching Imam Hussain (a.s.) from behind, he took a sword and rushed into the battle field and killed the enemy, at the same time crying out in a loud voice, "How can any one dare attack my Mawla while I am alive." He continued to fight maintaining his position behind Imam Hussain (a.s.). Muawiya saw this and asked, "Who is that boy?" When he was told he was Abbas ibne Ali, he said, "By God! No one can fight like that at that age except a son of Ali!" Hazrat Abbas (a.s.) grew up to be a tall and handsome man. He was so tall, that when he sat on a horse his feet touched the ground. He was so handsome that he was known as Qamar-e-Bani Hashim, the Moon of the family of Hashim. Hazrat Abbas (a.s.) was also a valiant warrior. It was said that Muawiya did not dare invade Madina because of five men who were with Imam Hussain (a.s.) and could, together with their Imam, conquer a whole army. These were Muhammad Hanafia, a brother of Imam Hussain (a.s.), Hazrat Muslim ibn-e-Aqeel (a.s.), Abdullah Ibn-e-Jaffer (a.s.), Hazrat Abbas (a.s.) and Hazrat Ali ibn-al-Hussain (a.s.), our fourth Imam, Zainul 'Abideen (a.s.). When Imam Hussain (a.s.) decided to leave Madina in the month of Rajab 60 Hijrah, he did not encourage Muhammad Hanafia and Abdullah Ibn-e-Jaffer to accompany him. He wanted to make sure that no one at the time or in the future would suggest that Hussain (a.s.) wanted to fight for the khilafah. Just before Imam Hussain (a.s.) left Madina, Ummul Baneen (a.s.) summoned all her four sons and said to them, "My sons you must remember that while I love you, Imam Hussain (a.s.) is your Master. If Imam (a.s.) or his sisters or his children get injured or hurt while you are still alive, I will never forgive you." There were tears in Hazrat Abbas's (a.s.) eyes as he promised his mother that he and his brothers would lay down their lives for Imam Hussain (a.s.) and his children. 1-Qamar-e-Banihashem (THE MOON OF BANIHASHEM'S PROGENY) This was his most famous nickname. The reason behind that was his good looking face which was resembled to the moon. 2-Saqqa' (THE ONE WHO BRINGS WATER) This is his another famous nickname. Since he was dealing with bringing water to Imam Hussein (A.S)'s camps and supplying Imam's thirsty children with water, he was given this nickname. 3-Hamel-ul-Lava' (THE ONE WHO CARRIES THE FLAGS) This nick name was given to him because he was the one who carried the flag in Imam Hussein (A.S)'s troop. 4-Raees-e-Askar-al-Hussein (THE COMMANDER OF IMAM HUSSAIN(A.S.)'S TROOPS) This nickname was given to him because he was the commander of Imam Hussain(a.s.)'s troops. The caravan reached Kerbala on 2nd Muharram. From the day the sad news of Hazrat Muslim's (a.s.) murder had reached the caravan of Imam Hussain (a.s.), Hazrat Abbas (a.s.) and his brothers increased their vigilance to protect the Imam and others. Hazrat Abbas (a.s.) was very popular with the children of Imam Hussain (a.s.) especially Sakina (a.s.) who was only four years old. Whenever the children wanted anything they would cry out "Ya Abbas!" or "Ya Ammahu! ", and Abbas (a.s.) would go running. But from the seventh of Muharram Abbas (a.s.) was unable to respond to their cries for water. Then came the day of Ashura, after Zuhr prayers one by one the brave companions of Imam Hussain (a.s.) fell in the battle field. At last only Imam Hussain (a.s.), his son of 18 years Ali Akber (a.s.) and Hazrat Abbas (a.s.) were left. Imam Zain-ul-Abideen (a.s.) laid sick in his tent. Several times Hazrat Abbas (a.s.) asked Imam Hussain (a.s.) for permission to go and fight. Each time Imam Hussain (a.s.) would reply "Abbas, you are the captain of my army, you are my 'alamdaar - the standard bearer". Hazrat Abbas (a.s.) would never argue with Imam Hussain (a.s.). His three brothers were killed in the battle fought after Zuhr. Imam Hussain (a.s.) could see the anger in Hazrat Abbas's (a.s.) eyes, especially when Hazrat Qasim's (a.s.) body was trampled upon by the enemy. Imam Hussain (a.s.) knew that if he let Abbas (a.s.) go and fight, there would be a massacre in the enemy rank. Imaam Hussain's (a.s.) object was to re-awaken Islam and not to score a victory on the battle field. Just then Bibi Sakina (a.s.) came out holding a dried up mashk. She walked up to Hazrat Abbas (a.s.) and said "AL ATASH, YA AMMAHU! I am thirsty O my uncle Abbas !". Abbas (a.s.) went to Imam Hussain (a.s.) and requested for permission to go and get water for Sakina (a.s.). Imam Hussain (a.s.) gave his permission. Abbas (a.s.) put Sakina's (a.s.) mashk on the 'alam, mounted his horse and rode up to Imam Hussain (a.s.). He said "I have come to say goodbye". Imam Hussain (a.s.) said "My brother, come and embrace me". Hazrat Abbas (a.s.) dismounted his horse. There were tears in Imam's (a.s.) eyes. As Hazrat Abbas (a.s.) prepared to mount his horse, Imam Hussain (a.s.) said, "My brother, I want a gift from you. I want your sword". Hazrat Abbas (a.s.), without uttering a word, gave Imam Hussain (a.s.) his sword and rode into the battlefield, armed only with a spear and holding the 'alam. There were 90,000 enemy soldiers in the battlefield. They had all heard of the valour of Hazrat Abbas (a.s.). A cry arose, "Abbas is coming!" Yazeed's soldiers started hiding behind one another. A few brave ones dared go near Hazrat Abbas (a.s.) but were soon put to death by the spear or by a kick. Hazrat Abbas (a.s.) reached the river Furaat. He filled the mashk with water. He himself was very thirsty. In fact every one in Karbala was thirsty for 3 days but Hazrat Abbas (a.s.) was thirsty since the 2nd of Muharram for 9 days. He took the water in his palms, looked at it and threw it away saying, "O water of Furaat, my lips can welcome you only after Sakina has quenched her thirst !?" He placed the mashk on his 'alam and started to ride back. Umar ibn-e-Sa'ad cried out, "Do not let that water reach Hussain's camp, otherwise we shall all be doomed!" A soldier climbed a tree and as Hazrat Abbas (a.s.) was riding past the tree he struck his sword on the right shoulder The spear and the right arm fell on to the ground. Just then someone crept behind Hazrat Abbas (a.s.) and struck him on the left shoulder. His left arm and the 'alam fell. Hazrat Abbas (a.s.) gripped the mashk with his teeth. His one objective was to get the water to Bibi Sakina (a.s.). Fighting with his feet he urged the horse to get him to Imam's (a.s.) camp as quickly as possible. Alas ! an arrow was shot. It went flying across the desert and hit the mashk. The water began to pour out and with the water all the hopes of Hazrat Abbas (a.s.) poured on to the sands of Kerbala to be buried forever in the thirsty desert. Hazrat Abbas (a.s.) now did not want to go back and face Bibi Sakina (a.s.). With his feet, he signaled the horse to turn back. The enemy surrounded him from all sides. A spear came flying and struck his eye. Abbas (a.s.) fell from the horse!!. Imagine someone falling from a horse and not having his arms to support him. As he fell, he cried out "My salaams to you Ya Mawla!" Imam Hussain (a.s.) seemed to lose all his strength when he heard the voice of his dear brother Abbas (a.s.). When Hazrat Abbas (a.s.) left to go to fetch water, Imam (a.s.) stood at the gate of the camp watching the 'alam. Bibi Sakina (a.s.) was standing next to Imam Hussain (a.s.), also with her eyes fixed on the 'alam. When Abbas (a.s.) reached the river bank and bent down to fill the mashk, the 'alam disappeared from sight. Bibi Sakina (a.s.) was frightened and looked at her father. Imam (a.s.) said, 'Sakina, your uncle Abbas is at the river bank'. Sakina (a.s.) smiled and said, 'Alhamdulillah !' and called out all the children to welcome Abbas (a.s.). When Hazrat Abbas (a.s.) lost both arms, the 'alam fell onto the ground. Sakina (a.s.) could see it any longer! She looked at Imam Hussain (a.s.), but he turned his face away. Bibi Sakina (a.s.) began to tremble with fear and her eyes filled with tears. She raised her hands and prayed, 'Ya Allah! Do not let them kill my uncle Abbas! I will never ask for water again!' and ran inside to her mother. Imam Hussain (a.s.) reached where Hazrat Abbas (a.s.) was lying. It was a tragic sight. Hazrat Abbas (a.s.) was lying on the ground. Both arms had been severed! There was an arrow in the right eye and blood blocked the left eye. As soon as Hazrat Abbas (a.s.) sensed the presence of Imam Hussain (a.s.) he said "Mawla, why did you take the trouble to come over? Please go back and look after Sakina." Imam Hussain (a.s.) said, "My dear brother, all your life you have served me and my children. Is there anything I can do for you at this last moment of you life ?" Hazrat Abbas (a.s.) replied, "Aqaa, please, clean the blood from my eye so that I can see your beloved face before I die!" Imam (a.s.) cleaned the blood. Hazrat Abbas (a.s.) fixed his gaze on Imam (a.s.). Then he said, "Mawla please do not carry my body to the camp. I do not wish Sakina to see me in this state!" Imam Hussain (a.s.) took Hazrat Abbas (a.s.) in his arms, and kissed his forehead. Just then our Mawla, our Mushkil Kushaa, Abbas ibne Ali (a.s.) breathed his last. Imam Hussain (a.s.) placed Sakina's mashk on the 'alam and carried the 'alam to the camp. He went to Bibi Zainab's (s.a.) tent. Imam Hussain (a.s.) could not say a word. He gave the 'alam to Bibi Zainab (s.a.) and sat down on the floor! The brother sister performed aza-e-Abbas.